The much anticipated Sky-Watcher AZ4 Alt-Azimuth mount is set to be a hit with astronomers and terrestrial observers alike. The design features separate clutches on both the Altitude and Azimuth axes and a panning arm, which can be fixed in two separate positions. The movements are buttery-smooth and telescopes can be manipulated with effortless precision. Telescope OTA’s attach to the mount via a standard Sky-Watcher dovetail bar. 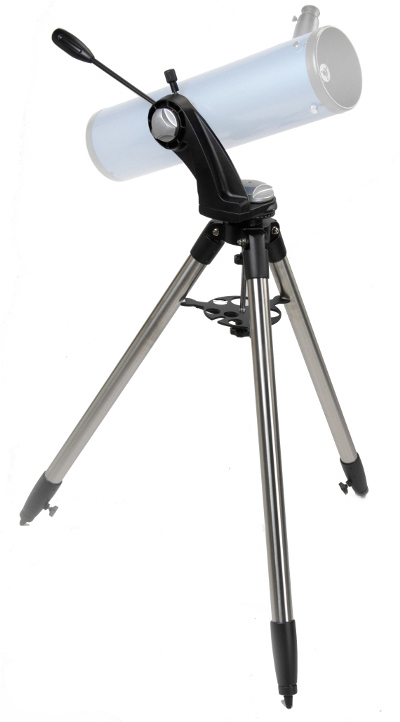 Also supplied with this mount is an L-bracket which allows the easy attachment of a spotting scope or camera. 2) With 1.75” stainless steel legs for maximum strength and stability.